Fordham University Press, 9780823257041, 164pp. This book tests the proposition that the humanities can, and at their best do, represent a commitment to ethical reading. And that this commitment, and the training and discipline of close reading that underlie it, represent something that the humanities need to bring to other fields: to professional training and to public life. What leverage does reading, of the attentive sort practiced in the interpretive humanities, give you on life? Does such reading represent or produce an ethics? The question was posed for many in the humanities by the "Torture Memos" released by the Justice Department a few years ago, presenting arguments that justified the use of torture by the U.S. government with the most twisted, ingenious, perverse, and unethical interpretation of legal texts. No one trained in the rigorous analysis of poetry could possibly engage in such bad-faith interpretation without professional conscience intervening to say: This is not possible. is more and more what running the world is all about. This volume brings together a group of distinguished scholars and intellectuals to debate the public role and importance of the humanities. Their exchange suggests that Shelley was not wrong to insist that poets are the unacknowledged legislators of mankind: Cultural change carries everything in its wake. The attentive interpretive reading practiced in the humanities ought to be an export commodity to other fields and to take its place in the public sphere. 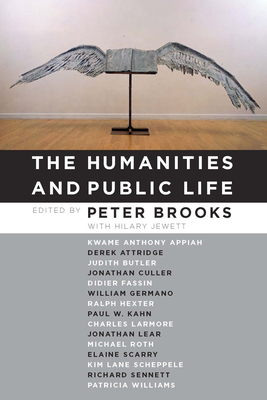 Peter Brooks is Sterling Professor Emeritus of Comparative Literature at Yale University and the Andrew W. Mellon Foundation Scholar at the University Center for Human Values and the Department of Comparative Literature at Princeton University. Hilary Jewett, Assistant Director of the "Ethics of Reading" project, is a lawyer, literary scholar, and editor.